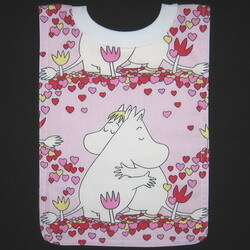 Love, Love, Love the Moomin Blanket from Mummi Quilts that we received for my baby. It is now her special blanket, that goes with her everywhere! 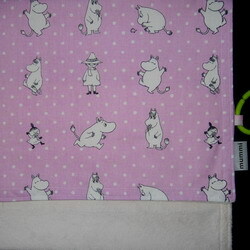 We received an adorable pink moomin blanket like the one pictured below. 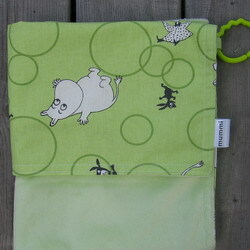 This beautiful moomin blanket handmade by Mummi Quilts is made of chennile fabric, and is covered with the cutest moomin fabric. In case you are wondering, moomin’s are adorable little character’s from a series of children’s books. Mummi Quilts has the most beautiful blankets, bibs, clothing, toys, hats and bags, along with a great line of accessories. Products made with quality fabrics and can be personalized for a special added touch. Many designs to choose from, you will be sure to find just what you are looking for! GIVEAWAY ALERT!! One Lucky BabyElan Reader will receive a PERSONALIZED MOOMIN PULLOVER BIB ! Just comment below what name you would like on your bib. Contest ends in 2 weeks: 12/8/11. (Open to U.S and Canadian residents only). Please note that we will accept a maximum of 6 entries per person, as outlined below.